The National Highway Traffic Safety Administration (NHTSA) reports that in 2013, 743 people lost their lives in bicycle/motor vehicle crashes. They also report the number of estimated bicyclist injuries dropped to 48,000 in 2013, but that’s only down a small amount from 49,000 in 2012. Hospital record research shows that only a fraction of bicycle crashes causing injury are recorded by the police and could be as low as 10% which is very similar to walking injury figures. According to 2012 statistics, nearly a third of all injuries are caused when bicyclists are struck by cars. There is obviously a risk of serious injury and death when bicyclists attempt to “share the road” with cars, trucks, motorcycles and buses. Our Atlanta GA bicycle accident lawyers understand the unique elements that are required when pursuing litigation in a cycling claim. Our law firm has been recognized as recovering the largest recovery in the state of Georgia for a bicycle accident. We are prepared to fight to defend the rights of bicyclists, and we understand that all too often the blame tends to be placed on the cyclist. We will diligently work to advocate for the rights of bicyclists. Typically, the most common cause of bicycle accidents are when drivers of automobiles (cars, trucks, and buses) fail to see or fail to yield to bicyclists. And when motor vehicles collide with bicycles, the results can be devastating to the bicyclists. Bicyclists who are injured in an accident where a car is involved can suffer serious, life threatening injuries which may result in costly medical bills. The severity of most bicycle accident injuries is due to the fact that the nature of bike riding leaves bicyclists much less physically protected from harm. In addition to death, bicycle-related injuries can result in severe injuries. Common Head Injuries – A cyclist thrown over the handlebars or thrown to the ground, trees, or vehicle that results in an impact to the head will have a greater chance of a head injury. Helmets help but can’t stop an injury if the impact is too great. However, cyclists who refuse to wear them are at a higher risk of severe head injury. Common head injuries include skull fractures, bruising, and concussions. Traumatic Brain injuries – A traumatic brain injury is a brain injury that is the most extreme and serious. Sometimes that is a “closed head injury” where there is no laceration and the injury to the brain goes undiagnosed until later. While wearing a helmet greatly reduces the potential impact to the brain, the high-impact nature of collisions often leaves protected cyclists injured as well. Traumatic brain injury can be permanently debilitating and require rehabilitation or constant care. Spinal Cord Injuries – Cyclists are often thrown onto the road or nearby objects since there is nothing to restrain them in a high-impact collision. This can damage the spinal cord and frequently results in fractured vertebrae, nerve damage, displaced discs, and other similar injuries. A back injury can be very difficult to recover from as they often involve chronic pain and can result in full or partial paralysis as well as other immobility impairments. This can lead to impairments that require lifestyle modifications such as wheelchair use, chair lifts, vans specifically designed to transport wheelchairs, ramps and the widening of hallways and redesign of bathrooms to accommodate wheelchairs. Facial Injuries – Broken or fractured jaws and noses, knocked out teeth, and the loss of eyesight can all be the result of bicycle injuries. Helmets can mitigate these injuries somewhat due to their design and how they protrude, but there is no guarantee. Other potential injuries to the face include road rash, permanent scarring, and other damage that will require plastic surgery to repair. Broken Bones – The most commonly reported broken bones include arms, legs, wrists, ankles, and collarbones. Other orthopedic issues can include torn tendons and ligaments. These type injuries are the most common. Loss of Limbs – Losing limbs is not as typical but it occurs and when it does, it is life changing as it requires rehabilitation to learn how to use a prosthetic device and will affect the quality of life for the injured cyclist forever. All of these injuries, as well as road rash, scrapes and contusions, can result in hospital stays that will create a financial hardship on the injured cyclist and their family. The average stay in a hospital costs over $8,000 a day. If the patient has surgery, the average cost rises. In addition to hospital costs, injured bicycle victims can suffer other types of expenses and damages such as future medical care / rehabilitation, loss of income, physical and emotional pain and suffering, loss of quality of life and others. Future Medical Care or Rehabilitation. While the injuries listed above will cause extensive hospital and medical costs, the bicycle accident victims who have been seriously injured may require months, years or even a lifetime of future medical care and/or rehabilitation. Depending on the severity of the accident, bicycle accident victims may not be able to work after their injury. Even if there are supplemental forms of income available, those sources usually are only a fraction of the previous income and will end whether the need is still ongoing or not. Pain and Suffering (Physical and Emotional). A personal injury claim can include compensation for damages relating to emotional pain and suffering as well as physical pain and suffering. Both of those can include amounts for future pain and suffering based on extent of injuries. The nature and type of injury, extent of pain, and length of time the injured victim is expected to suffer are factors that will be considered when awarding damages for pain and suffering. Injured bicycle accident victims may not be able to have the quality of life they were used to prior to them being injured. This may be as simple as going on a walk or it may be as significant as inability to drive or loss of mobility. Every case is different. Having the experienced bicycle accident lawyers at Slappey & Sadd, LLC to represent you can make all the difference. They know how to investigate your case, prepare your case for trial and get the settlement or verdict you deserve. Don’t be intimidated by insurance companies that play hard ball. Rely on your attorney and let him take care of you. If you are involved in a cycling accident, you need to record everything. A personal injury claim usually is more successful when there are details and documentation to support your claim. Step 1 – Emergency Medical Attention is Priority One. Call 911, get out of the way of danger and seek medical care before anything else. Step 2 – Get a Police Report. As your lawyer, we believe you. An insurance company won’t. The police report is independent and the goal standard in describing what happened and assigning liability. Make sure you clearly explain what you saw and experienced so those details get incorporated into the official police report. Step 3 – Do Not Talk to the Other Party. You should get insurance or basic ID or contact information from the other party but limit contact and don’t make any statements or admit fault. Step 4 – Look for Witnesses. If there are any unbiased people that witnessed the event, get their contact information and encourage them to speak with the police. Step 5 – Document Everything. Write down what you remember leading up to and during the accident. Then, after it’s over, document your injuries. This includes emergency care, medical treatment, medications and rehabilitation. Don’t forget to include missed work, impact on your life (stress) and anything that might help your case. Step 6 – Preserve Evidence. Take photos, don’t repair your bicycle, keep clothes (even if torn or bloody) unwashed so that your legal team and the experts they hire have access to everything. Dealing with insurance companies is very complex. Your focus should be on recovery from your injuries. Your lawyer will focus on making sure you receive the compensation you deserve. 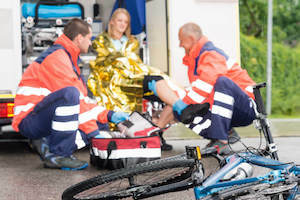 The Atlanta GA bicycle accident lawyers at Slappey and Sadd, LLC are experienced in dealing with bicycle accidents and their injuries and helping you get the compensation you are entitled to. We have the experience, skills and compassion you need as you face the long road ahead. Let us focus on getting you the compensation you deserve so you can focus on getting better. Slappey and Sadd, LLC will gather and secure evidence including reports, photographs and statements from witnesses. We are experts that can review medical records or reports from your treating physicians and make your case for compensation. If necessary, we will bring in medical experts (or any other experts) to help prove your case.